We sell a wide range of types of differential temperature controllers which are primarily used in solar hot water systems. However, with slight modifications, they can also be put to good use in other scenarios. 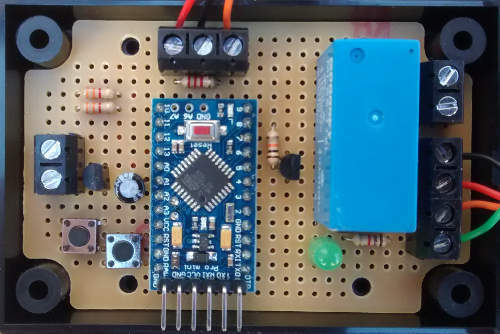 Pictured above is an Arduino Pro Mini based fan controller we made for use in conservatories and other sunny rooms to help to keep the temperature from getting too hot. This device can be used to turn on an extractor fan when the temperature in the room gets above a user set value, and keep it on until the room temperature has fallen below a second user set value. By dumping excess hot air from the room, the room’s temperature can be kept in a comfortable range. 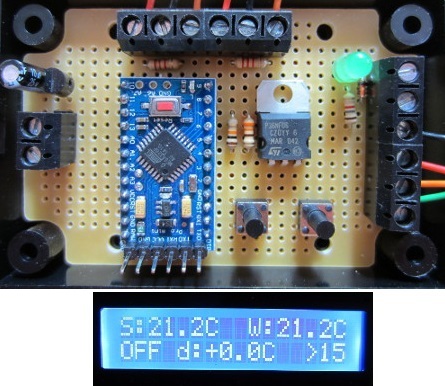 In the photograph of the device’s display above, the air temperature is showbn to be measured as 18.2C. The fan (which is currently off) will turn on when the air temperature goes over 25C, and then turn off again when the air temperature falls below 20C. We have also previously made these types of thermostatic controllers to automatically drive hot air from a sunny conservatory into cooler regions of the house. An insulated conservatory can still get very hot even in the winter months, so sending the hot air to the cooler side of the house is an easy and cheap way to reduce heating bills. Pictured below is a solar water heating pump controller which we recently made for use within a system which has two solar collectors – one on an East-facing roof and one on a West-facing roof. 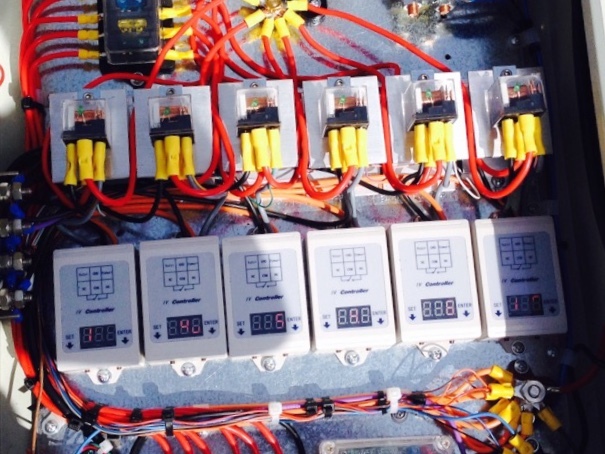 We have previously made an East West Solar Water Heating Pump Controller for use in a more complex system which controlled valves which were used to select whether to take solar heated water from the East or from the West-facing collector. 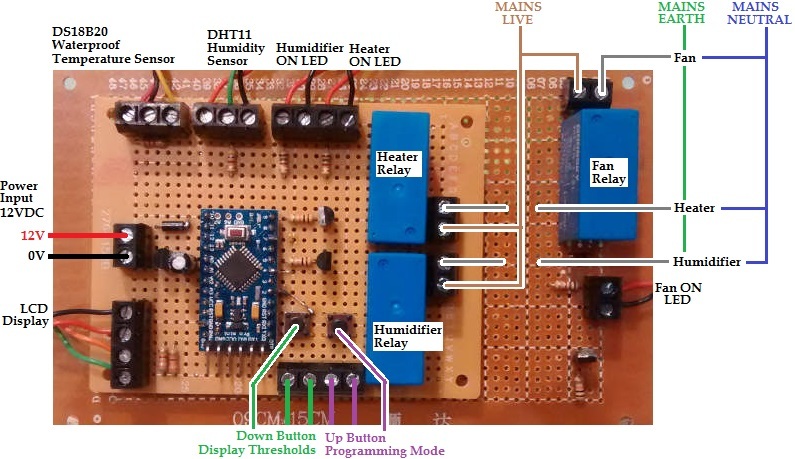 The above pictured controller however is just based around our 2014 Solar Water Heating Pump Controller, with the additional of a third sensor and a modified display output. 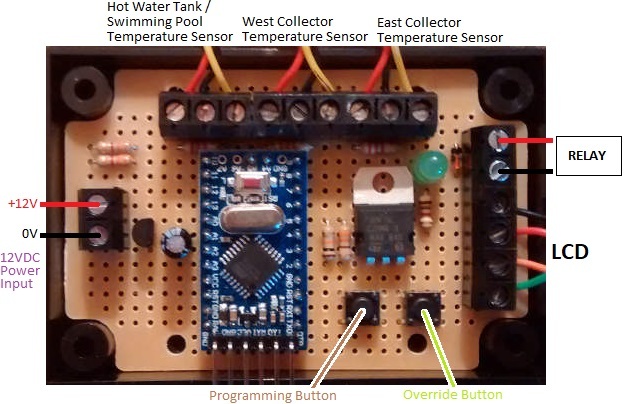 The standard 2014 controller will turn on the pump when the solar collector is a user programmed number of degrees hotter than the tank or pool to be heated. Our modified East/West version instead runs the pump whenever either the East or West-facing collector is that user programmed number of degrees hotter than the tank or pool. The water in the system is pumped from the tank or pool, up through both solar collectors in turn, and back again in a loop. Therefore, this simpler version has the disadvantage that water from the hotter collector (or from the tank/pool) may cool a little in the colder collector as heated water flows through it. However, overall the system is pretty efficient considering the disadvantage of having to face collectors to the East and West instead of to the more optimal South (in the Northern Hemisphere) due to the orientation of the building. If you need any kind of solar water heating pump controller, please email neil@reuk.co.uk with details of your requirements. Pictured above is a low voltage disconnect device which we recently made for a client. 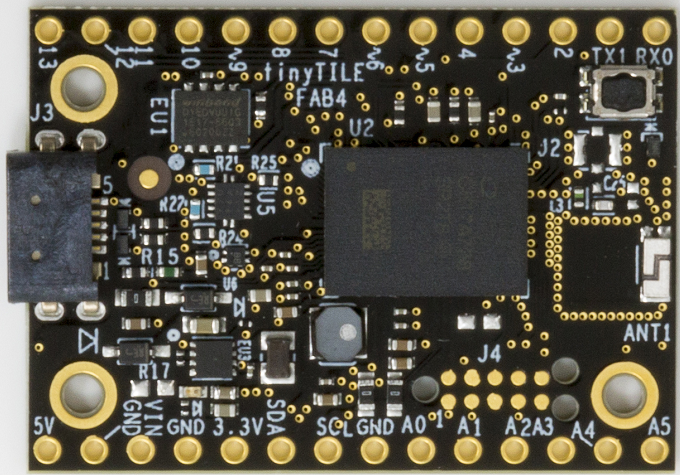 It offers all of the battery monitoring, protecting, and datalogging functions and features of our REUK Programmable Low Voltage Disconnect with Display and Datalogger, but with the added benefit of an on board microSD card to store the measured battery voltage once per minute. 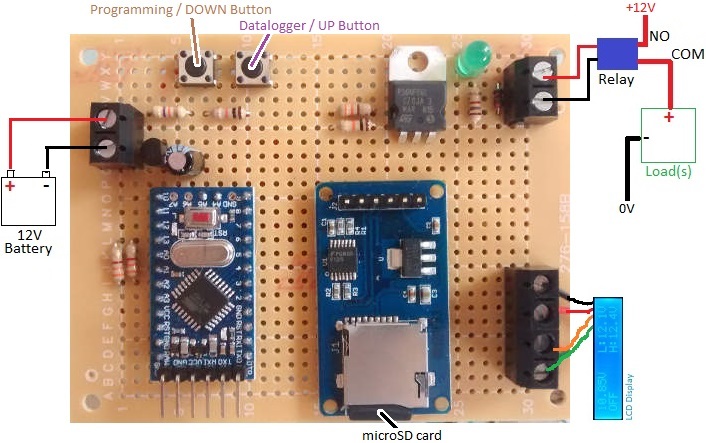 The voltage data is written to a simple text file on the SD card. 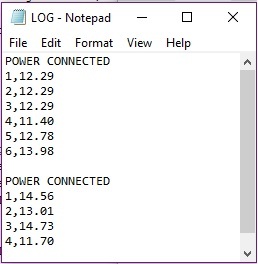 When the battery is connected to the low voltage disconnect and powers it, POWER CONNECTED is written to the log file. Then each subsequent minute, the battery voltage is written to the file preceded by the number of minutes since the power was last connected. For example the line 6,13.98 indicates that 6 minutes after the power was connected, the battery voltage was measured to be 13.98V. While the pre-existing basic datalogging of the LVD is useful for constantly displaying the minimum, maximum, and average measured voltages, every now and then it is good to have the option to copy the data from the SD card to a PC for more detailed analysis and plotting etc. If you need any kind of datalogger, please email neil@reuk.co.uk with details of your requirements. 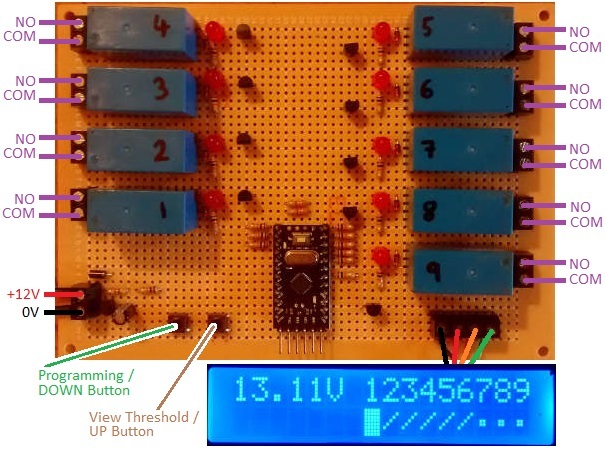 Pictured below is a timer we built to accompany a Poultry Egg Incubator Controller we made recently. When incubating eggs it is very important to keep track of the time since they were laid since, for example, eggs must be turned regularly until the last few days before hatching, and for some eggs the temperature and humidity ranges need minor adjustments during the incubation period. 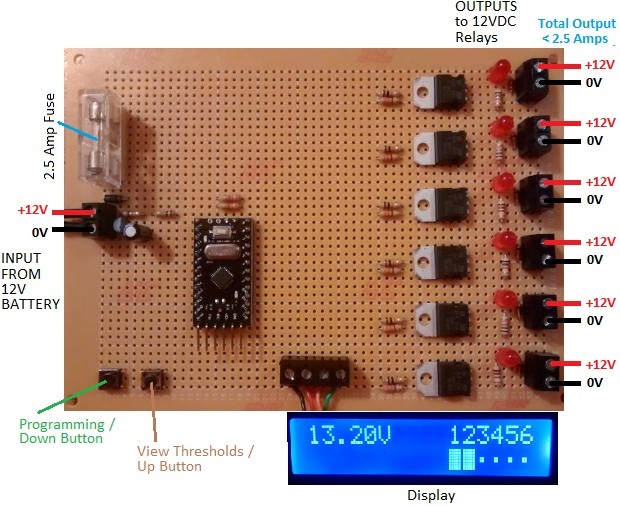 Our timer is 12VDC powered like the incubator, and has a display to show the elapsed time since it was last manually reset. The time is shown in days:hours:minutes:seconds format. 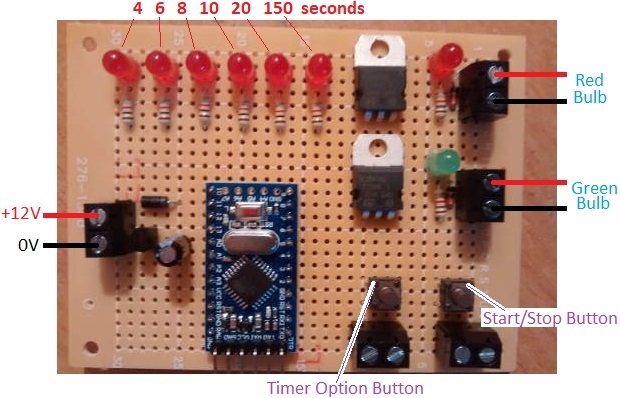 Since eggs take anything up to 6 weeks to hatch, the time elapsed is stored in memory on the timer microcontroller every 15 minutes so that if the power to the timer is cut for any reason (e.g. flat battery or accidental disconnection of one of the power leads), when the timer is reconnected to power, it will restart from within no more than 15 minutes of where it was before the power cut. After incubation has finished, a reset button (Reset Button 1) must be pressed for 1 second to reset the timer to 0:00:00:00 ready for the next lots of eggs to go into the incubator. 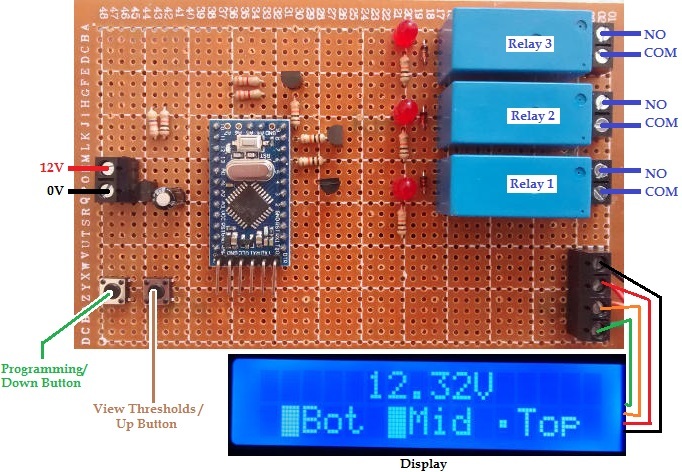 This timer is built around an Arduino Pro Mini. 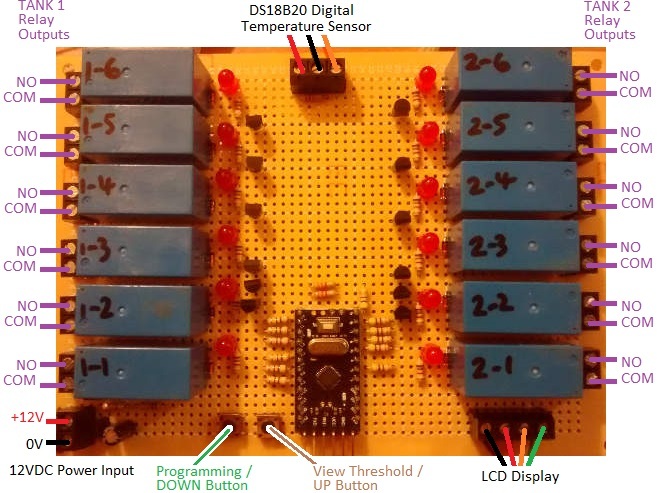 The microcontroller with its on board crystal keeps time well enough for this application. 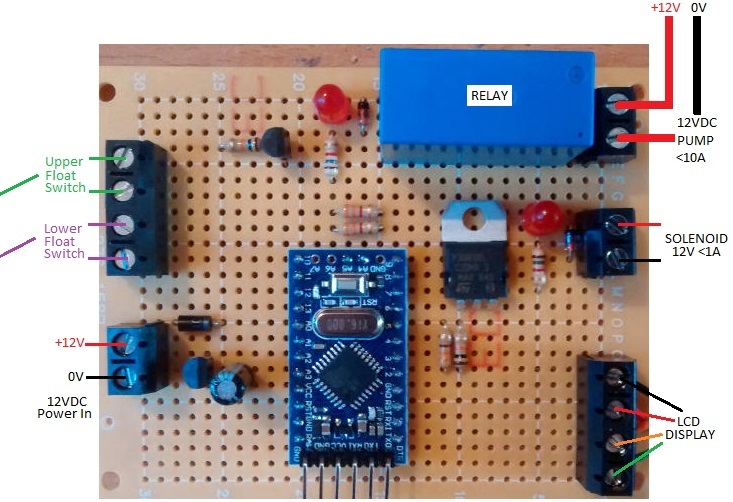 (If more accuracy was required we would have added a real time clock (RTC).). Reset Button 2 on the timer resets the internal clock which is limited to 4,294,967,295 milliseconds (just under 50 days) – plenty of time for pretty much everything up to ostrich eggs, but not long enough for emperor penguin, albatross, and some cuckoo eggs. For exotic eggs with very long incubation periods, an RTC would need to be added. 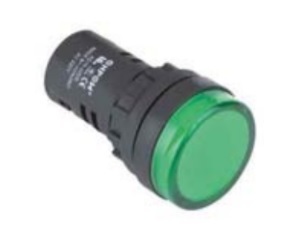 If you need a timer or a poultry incubator controller, email neil@reuk.co.uk with details of your requirements.